OSV Newsweekly is distributed free of charge to members of the military and many Catholic institutions. This special ministry is made possible through the generous donations from readers like you. 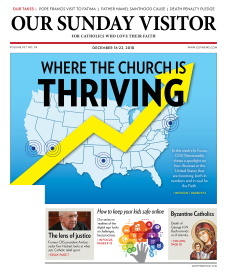 Your gift today will ensure OSV Newsweekly's unique perspective is read by engaged Catholics around the world. You can make your donation today through this secured web site. Our Sunday Visitor is a non-private 501(c)(3) organization and donations are tax-deductible.